Today is the official first day of spring and feels like it too. 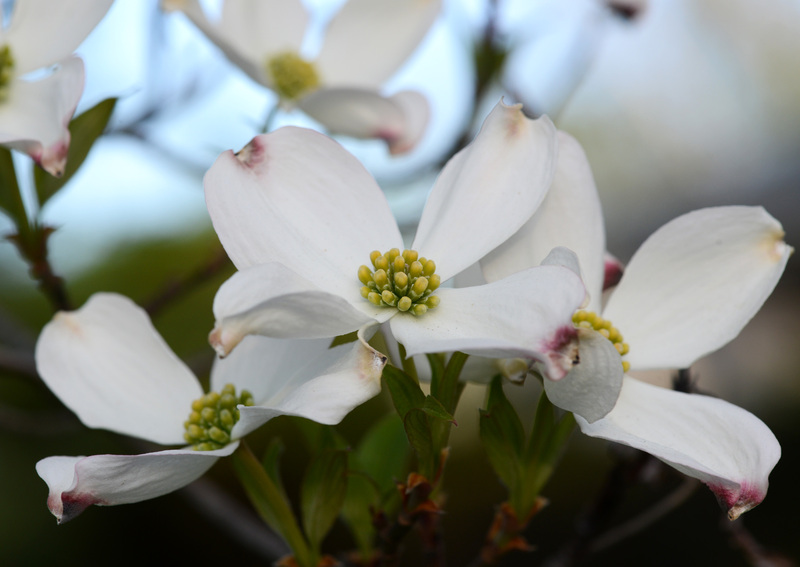 Spring flowers bloom, birds start clearing their territory and look for nesting spots. Not much to describe; just happy that spring is finally here. Rescued tulips also came up. Summer will be here in two weeks and I can feel the heat in the air already. 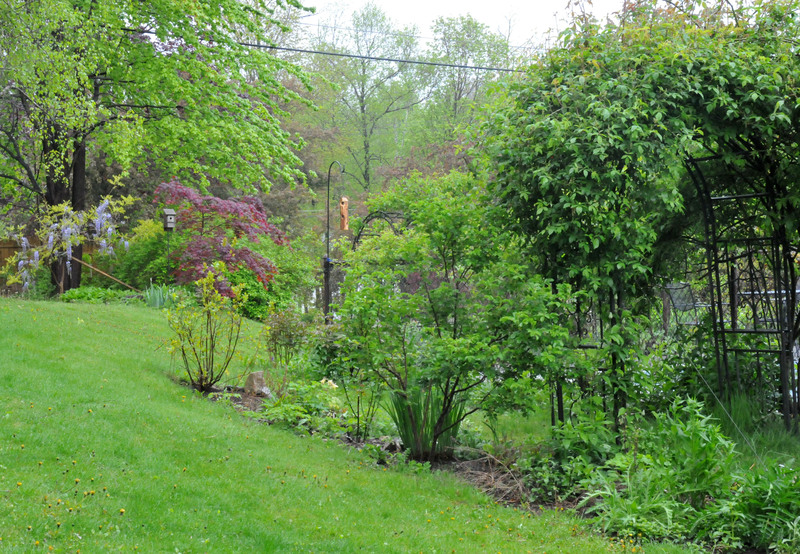 One day the temperature was hovering below 50º F and I had to wear a sweatshirt in the garden. The plants just stalled in their growth. The next day it hit 80º F and even wearing just a t-shirt it was too hot, but plants were shooting up all over the place. As much as there is an endless list of things to do at this time of year and never enough hours in the day, I still love this time of year the most. Life has renewed itself in the garden. There are some disappointments of course here and there. 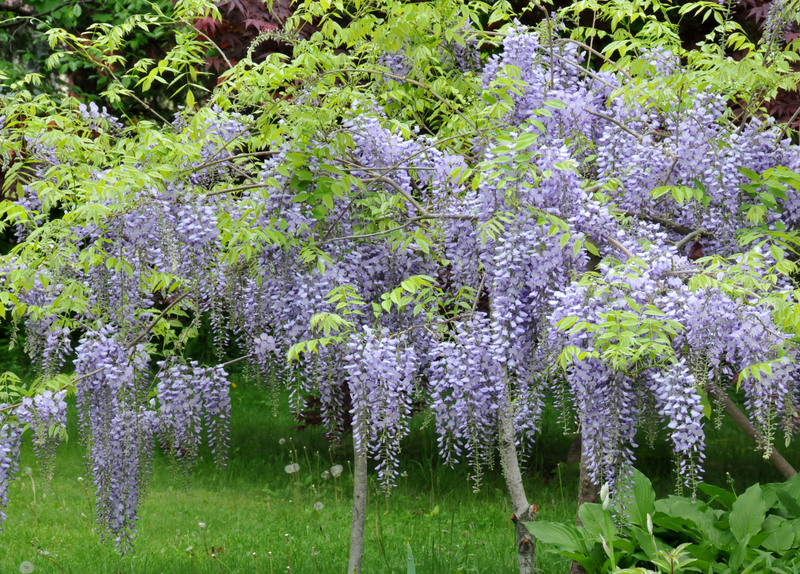 The Wisteria has only a few flowers, not a lovely waterfall of flowers as it did in years past. 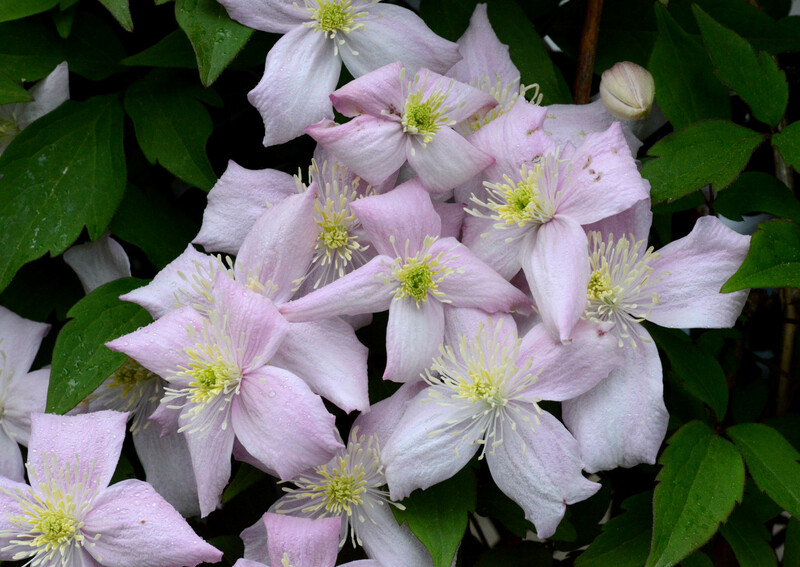 Clematis Montana and Lilac, both the common one and ‘Miss Kim’ blossomed less than usual. The Hydrangea has taken its time to sprout, coming up from the base so I don’t expect any flowers this year and I don’t see any new buds on the old branches yet either. They’re probably still struggling to shrug of winter. 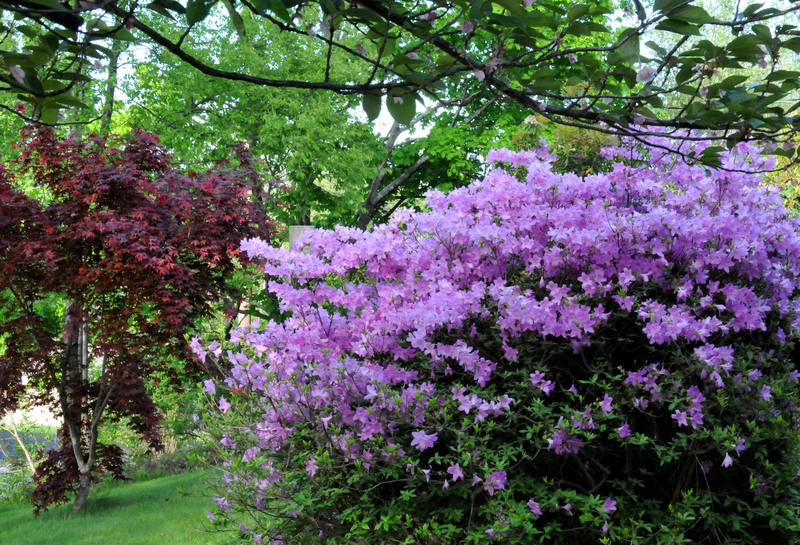 Even with less flowers so far this year there’s still plenty of color and scent in the garden. The Columbine has never ceased to amaze me. 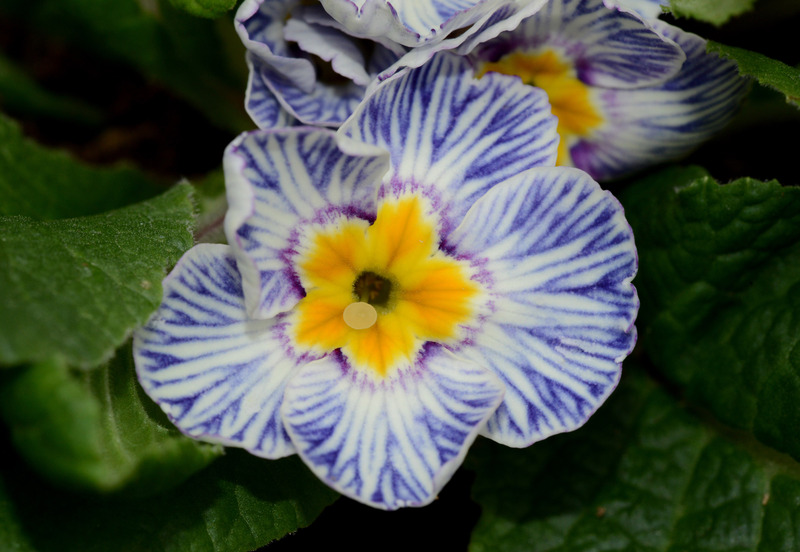 This year there are more and more new colors and forms that I know I didn’t plant. Since I let birds and bees do the pollination, it’s always a surprise. 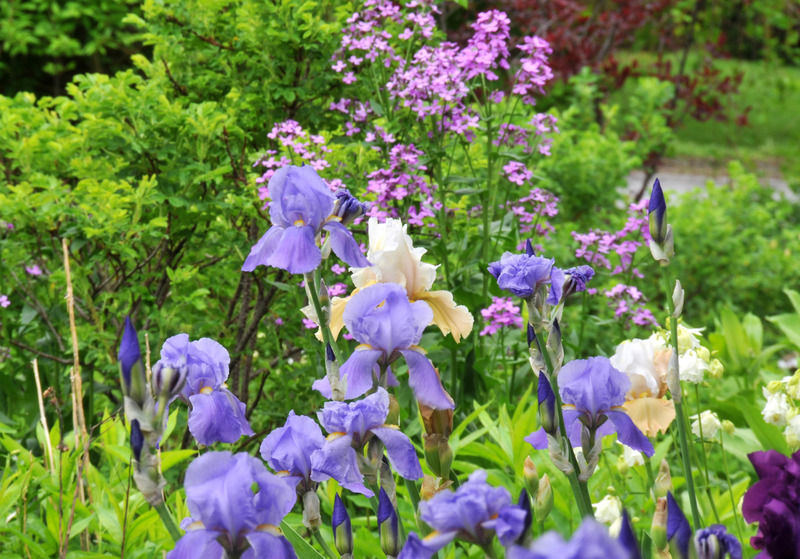 It’s also a good year for irises. Watering the vegetables a in the morning is a lovely time to be in the garden, with lovely scent wafting in the air and birds singing. This is the time of year that no matter how late I get home, I make it a point to go out into the garden and breath in the perfumed air while listening to the crickets and peepers performing their nocturne. It’s that time of year again: A time of colors and scents. 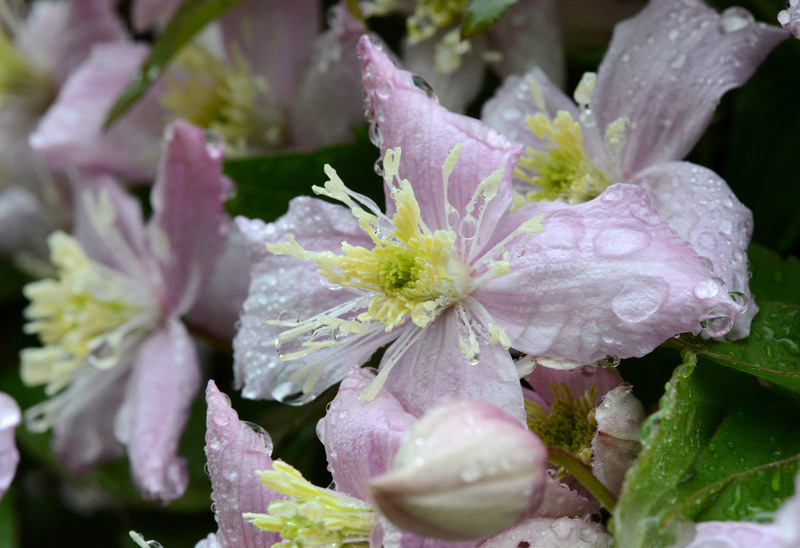 The unintended Clematis Montana (Clematis Montana var Rubens) proves itself of worthy for any garden again even though it blooms only once a year. I can hardly see it’s leaves this spring. 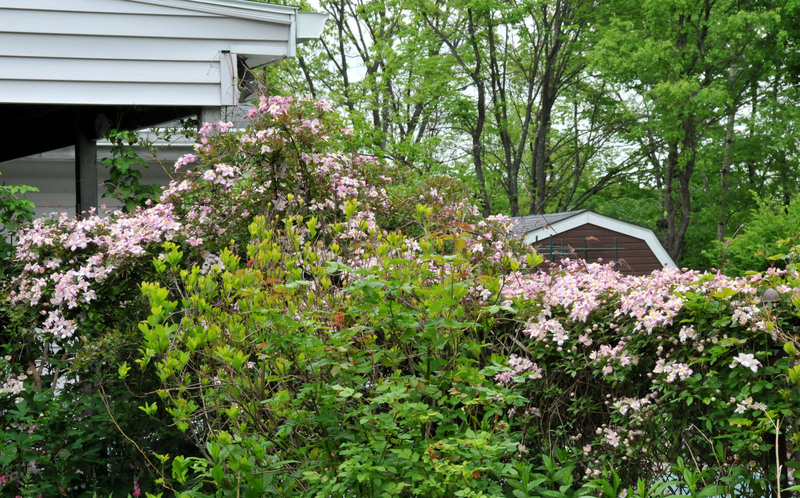 The pool fence is covered with the beautiful pink flowers and it has attempted to climb up the patio roof. We are still debating whether the scent is chocolate or vanilla. Either way, I have an urge to eat the flowers every time I smell them. I will be giving it a crew cut this year since it has been taking over other plants space. Guilt ridden just thinking about cutting it but for everybody’s benefit (plant-wise) it needs to be done. 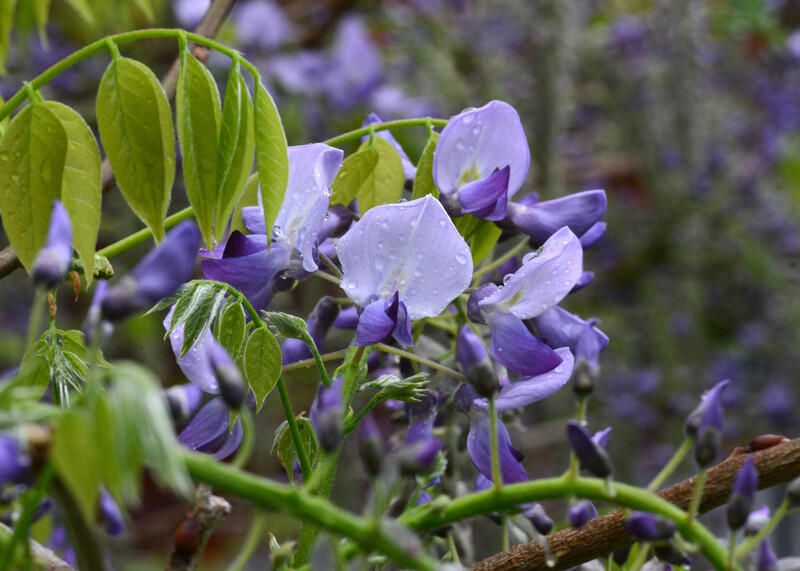 I still remember the arresting scene of Wisteria (Wisteria floribunda) that made me want to grow one. That was when I walked under the Wisteria Pergola in Central Park when it was in full bloom. 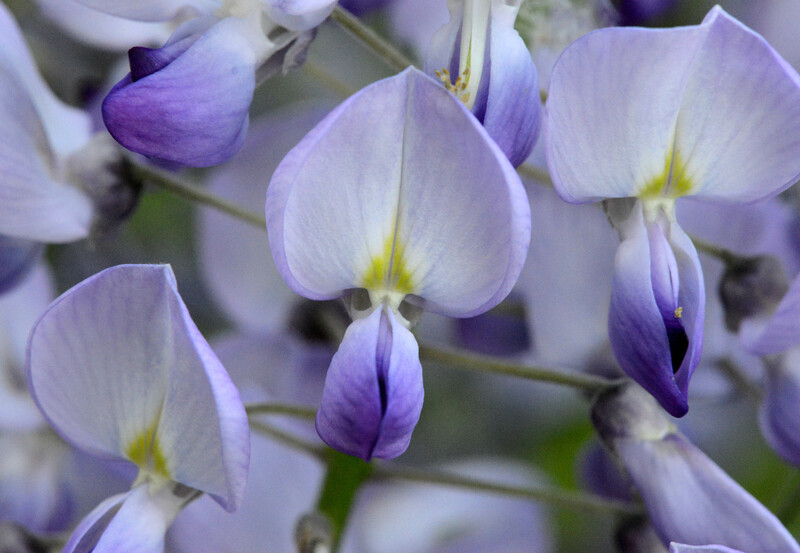 A sea of lilac pealike flowers cascaded down over my head and a powerful sweet perfume filled the air. I promised myself then and there that I would grow one when next I have a garden. When I moved from New York City to the current address, I was lucky enough to have a neighbor who had them growing on her property. She offered me a runner years ago and I promptly planted it by our pool fence. 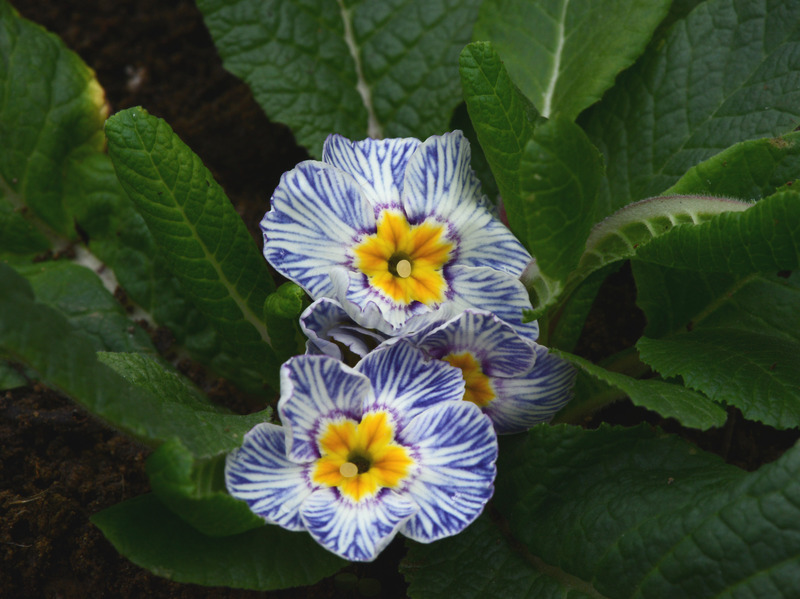 It proved to be a mistake since it grows several feet a season, too fast for such a small spot. I dug it up and replanted it by a dead tree stump and put up a supporting pole to keep it straight up. I also prune it every year to keep it in an umbrella shape. It’s still too low to walk or sit under but it’s a lovely shape and it will continue to grow upward. I think it loves where it is judging by the way it blooms so profusely and twice last year too. The second time didn’t produce that many flowers though. 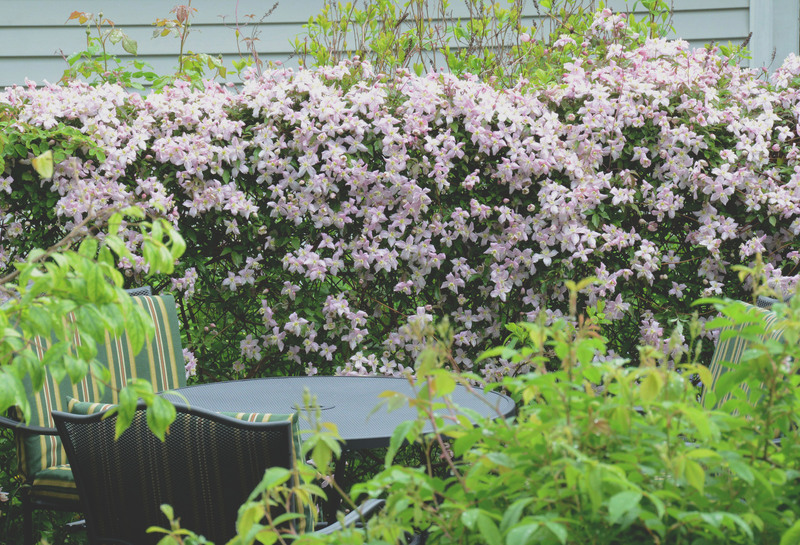 Aside from the lovely flowers, the fragrance perfumes our garden from morning to evening. I guess it’s eye catching enough when the handsome young man who supervised a crew of men topping our trees asked me what it was and commented that “it’s stunning”. 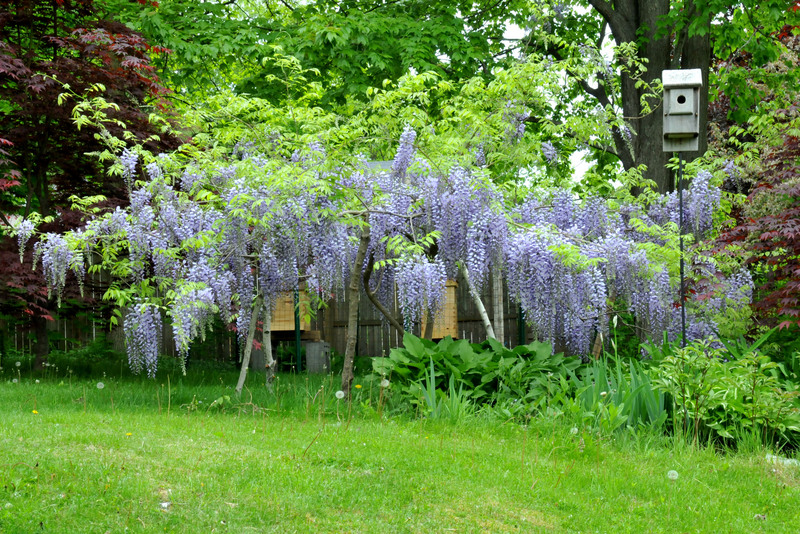 One problem with growing Wisteria is that it produces a lot of runners. I have to cut them off every year. I also had to dig another one out from the original planting spot. This year I have to dig one more out from the same spot and I hope it’s the last. This one will be relocated to the front lawn. It’s almost like the Day Lily, if you leave even a just a small section underground it will grow back. But it’s still worth growing. We used a rope to hold it straight for a year. 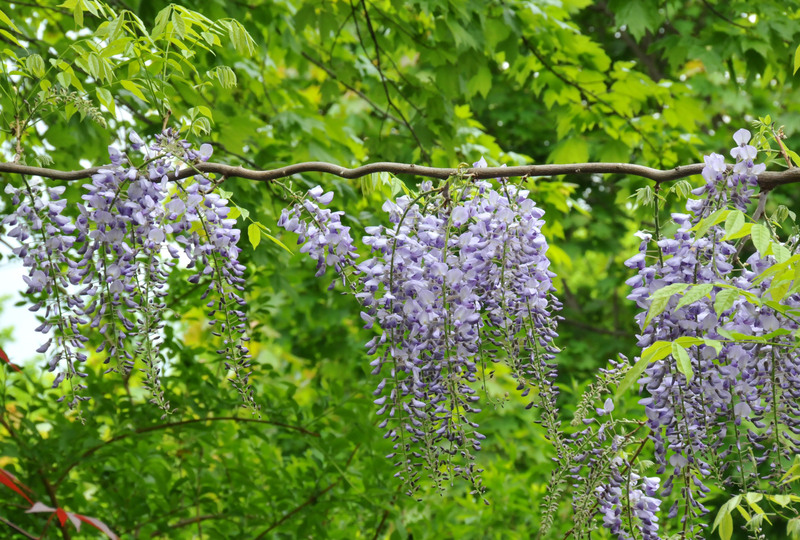 It climbed up the rope to the Maple tree and produced a flowering string this year. Flanked by Japanese Maples, with two bee hives in the back and a nest box currently occupied by a Blue bird family with two chicks. I really love this time of year when at every turn I see beautiful colors and the air is filled with a sweet scent. 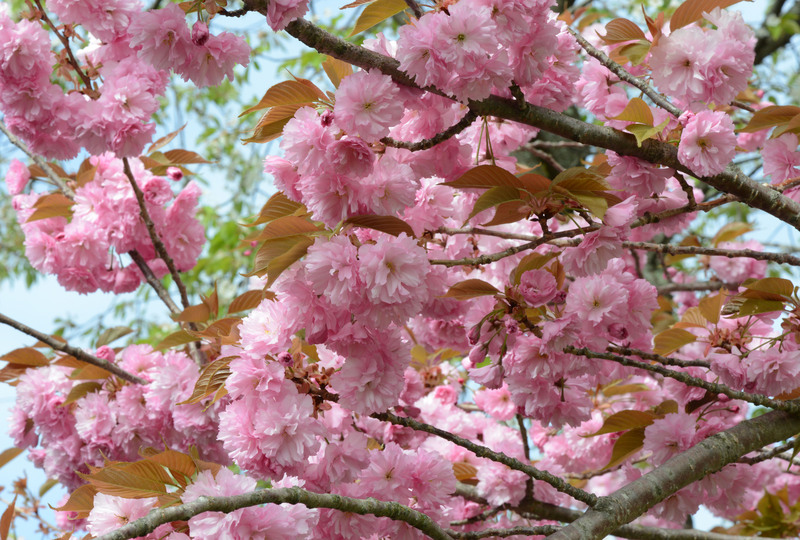 The ‘Kanzan’ cherry tree (Prunus Kanzan) in the front yard finally blossomed. Half of the tree is covered with white flowers; the other half with pink (it was grafted that way). This year the white one didn’t seem to be all that happy. The flowers dropped faster than they used to. This previously sad looking Dogwood is doing well now after being fed regularly in the last couple of years. 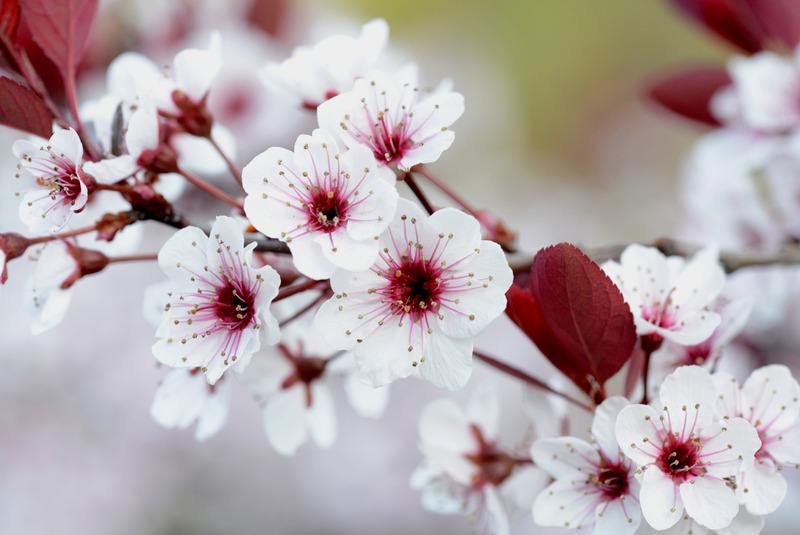 Aside from pretty flowers, Sand cherry also has a very strong honey scent. 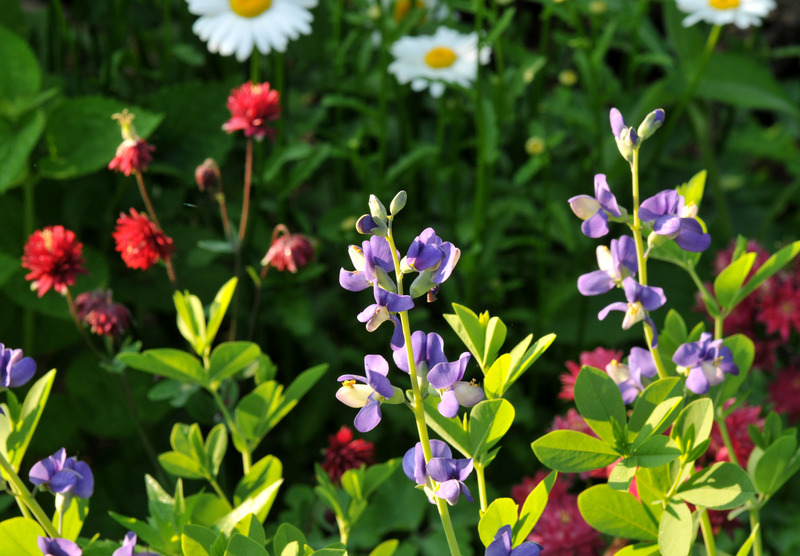 From spring forward is the time of year I prefer; it’s full of life, activity and colors. Birds are busy defending their territory, courting and looking for great spots to make a home. 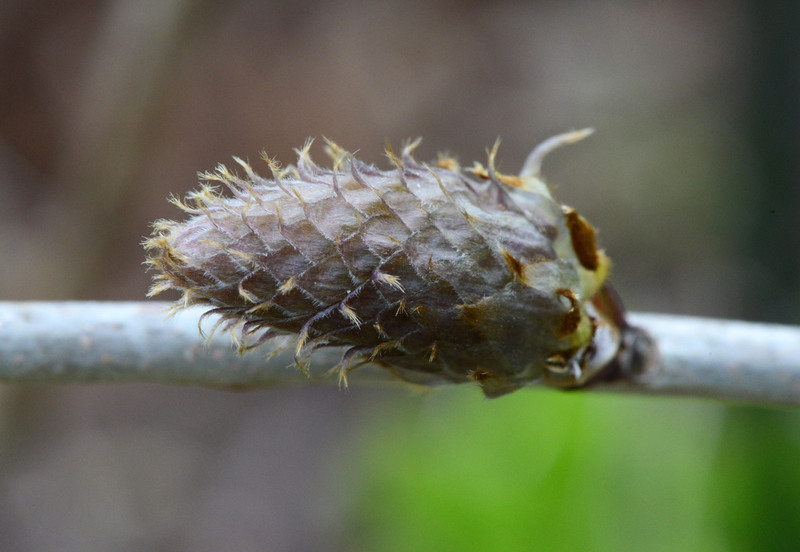 Insects start to come out of their hiding places and plants are pushing their new leaves and flower buds upward. 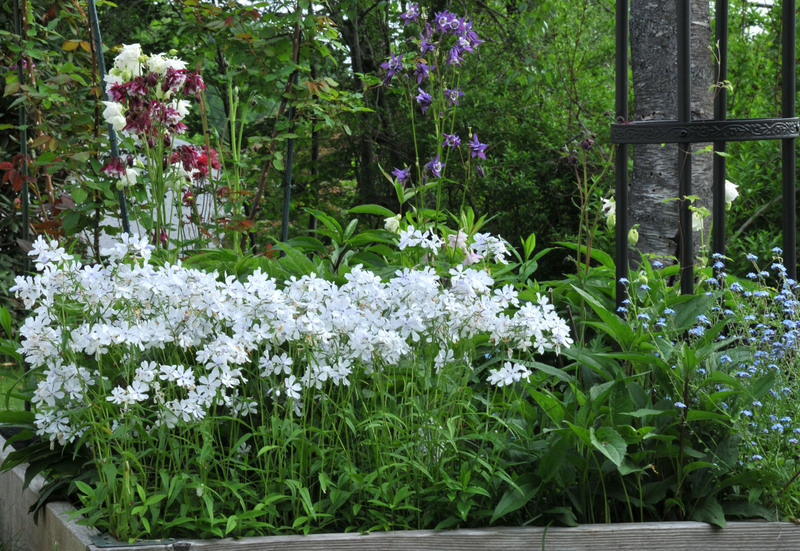 Once the bulb flowers start to fade away, the early blooming perennials come on stage and display their beauty. 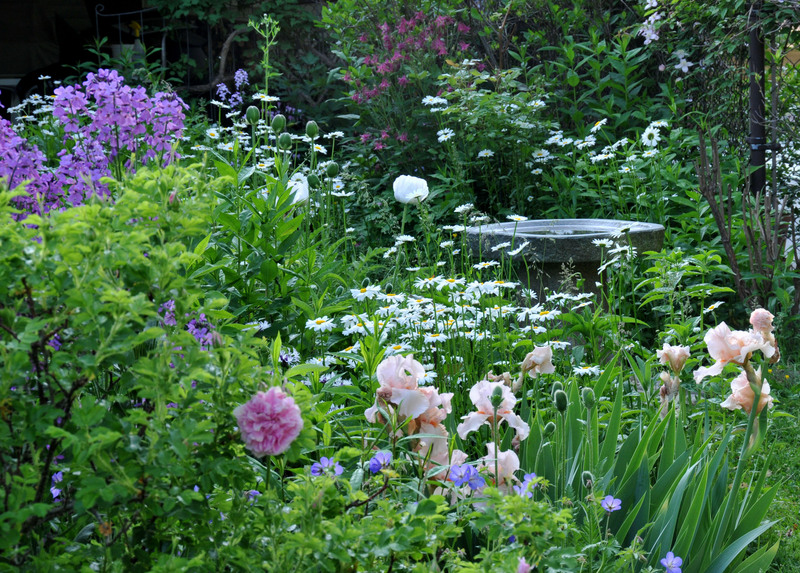 In our garden, all around our little home….full of color and sweet scent. Sorry, sound is not available at this moment. But we’re thinking of adding it in the future just for fun. Front walkway. 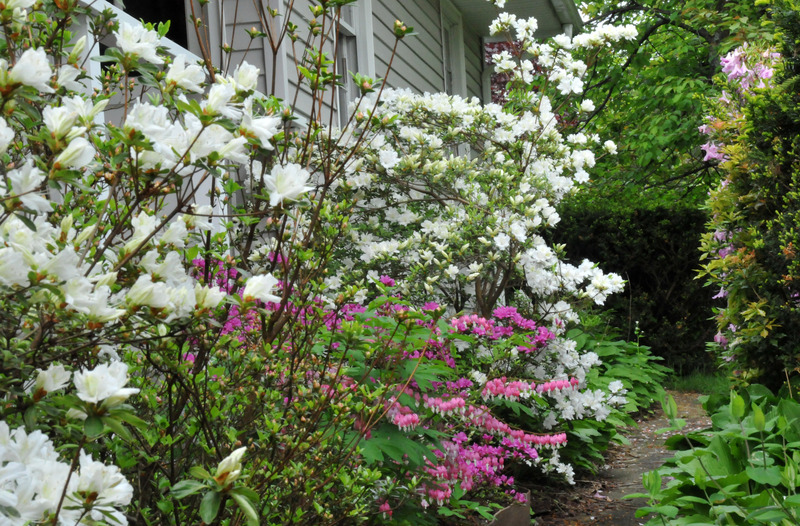 Azaleas and Bleeding heart. Front yard. 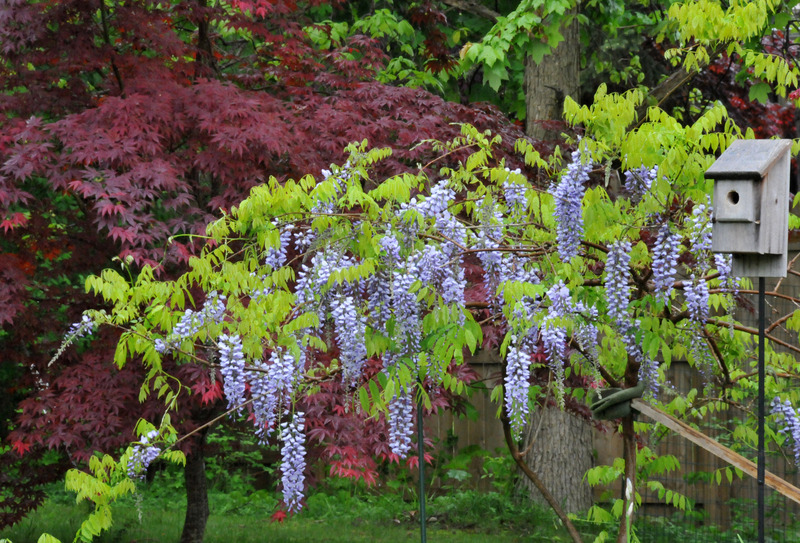 Wisteria and Japanese maple. A pair of Bluebirds moved into that house in the background, right. Walkway by the patio. 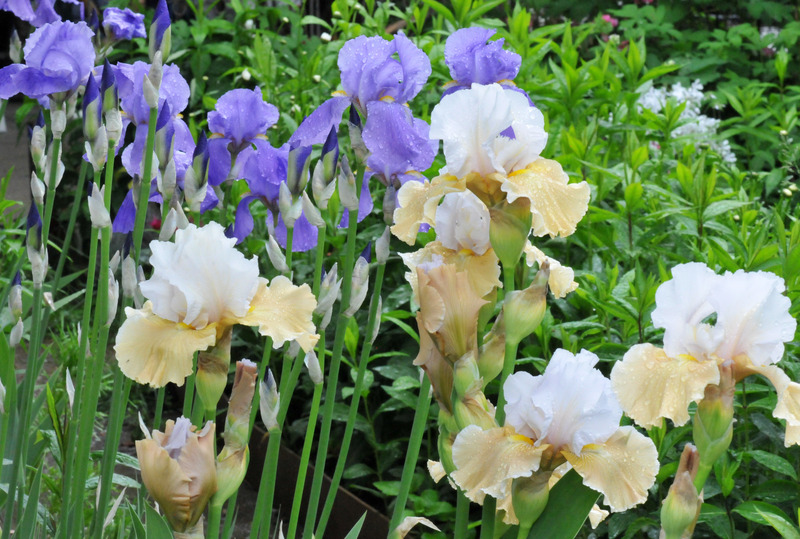 Bearded Irises.